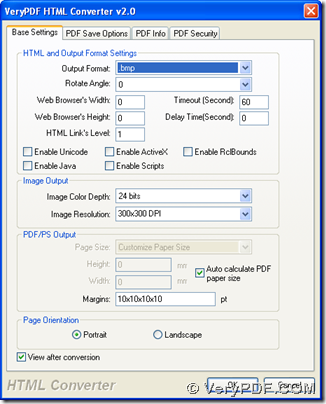 This article will get you out from trap of how to convert HTML to BMP in Windows systems. And in this process, our main tool is HTML Converter this time that is a great application that helps you convert various source formats to various targeting formats flexibly. For more information about this software, you can go to official website of HTML Converter. 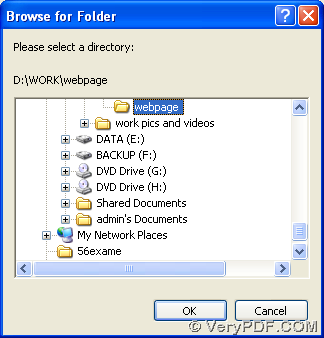 Moreover, besides this software, there are other products which can help you process this task, too, so you can go to veryPDF official website to overview more software. 3. Click button of “setting” on GUI interface, then on pop panel, you need to click tab “Base settings” there, so after that, on dropdown list of “output format”, please click “.bmp” there in order to set objective format as BMP, finally, one click on “ok” there can help you save this setting and jump back to GUI interface. 4. 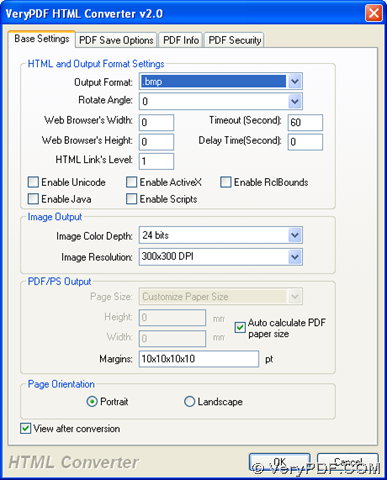 To select targeting folder and start this process from HTML to BMP, please click button of “start” on GUI interface, then after you select targeting folder in pop dialog box like below, please click “ok”, then after a few seconds, your BMP file can be produced into targeting folder automatically. This entry was posted in VeryPDF Blog and tagged html to bmp. Bookmark the permalink.